Every 10th December countries across the United Nations mark Human Rights Day, now in its 64th year. It was as important then, when the memories of World War II were fresh in the minds, as it is today, as we witness events in Syria and North Korea, amongst others. So we wanted to mark this important day as abuses of basic rights continue to occur all around the globe. It is also important because human rights have had a pretty bad press in recent years here in the UK. The media regularly publish stories about human rights arguments being used in trivial cases, with individuals claiming such-and-such is against their human rights. At the same time, the media report on claims by suspected terrorists or notorious criminals, who gain little sympathy for their claims because they have committed (or are accused of conspiring to commit) serious criminal offences. Lots of arguments against human rights are linked to questions about the power of the EU, the sovereignty of the UK and the way in which the Human Rights Act 1998 might have been misinterpreted and misused. So on this important day let’s clear up some myths about human rights. The fact is that most human rights cases are not about trivial breaches of rights, and the vast majority have nothing to do with terrorists or relate to other heinous crimes. Most cases involve ordinary people who have been mistreated in some way, and who are looking for justice. It is also important to know that many human rights claims don’t even mention the Human Rights Act 1998. Lots of rights existed in English law, long before the European Convention on Human Rights 1950 or the Human Rights Act 1998, and many of those rights – like the rule that agents of the state cannot enter your property without lawful authority or the right not to be locked up indefinitely without trial – were taken from English law and incorporated into those more recent human rights documents when they were drawn up. What the Human Rights Act fundamentally does is create a coherent legal system for many of those rights, and embed rights more firmly into our public life. Another myth is that the Human Rights Act is part of EU law – in fact the Human Rights Act has nothing to do with the EU. In the late 1940s, Winston Churchill proposed there should be a Europe-wide human rights treaty. Negotiations took place with European countries, and British civil servants drafted a treaty, which became known as the European Convention on Human Rights. We have been a signatory to this treaty since 1950. International treaties agreed between governments don’t have effect in the UK unless an Act of Parliament says they should, and so before the Human Rights Act was introduced, people could go to the Court in Strasbourg to claim their rights had been breached, but they could not claim in English courts. The Human Rights Act [http://www.legislation.gov.uk/ukpga/1998/42/contents] changed that, and brought the rights in the European Convention on Human Rights into English law. This leaves Strasbourg as a place of last resort, but usually the Strasbourg Court agrees with the decision of the courts here in the UK. In all the time we have signed up to the Convention, less than 2% of the applications made to the Court have resulted in the UK Government losing. This means that attacking the Human Rights Act and the Strasbourg Court, is also an attack on our own courts and the rule of law in the UK. Another myth is that the Human Rights Act gives courts in the UK too much power over Parliament. This is wrong. Under the Human Rights Act, courts can’t overturn decisions of Parliament. The Human Rights Act says that all public bodies, including courts, have to uphold the rights in the European Convention on Human Rights, but Parliament is not bound to follow the convention. If there is a conflict between an Act of Parliament and a right in the Convention, courts can try to see if there is a way to reconcile the two, but if they can’t then the Act of Parliament is supreme. If a person is unhappy with the decision of the courts in the UK and appeals to the court in Strasbourg, the Strasbourg court can’t overturn an Act of Parliament either. Today of all days it is important that we reflect not on the lurid and often ill-informed headlines but on the rationale behind the day. 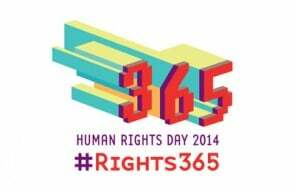 In fact, this year’s theme is Human Rights 365. It celebrates the fundamental proposition in the Universal Declaration that each one of us, everywhere, at all times is entitled to the full range of human rights, that human rights belong equally to each of us and bind us together as a global community with the same ideals and values.